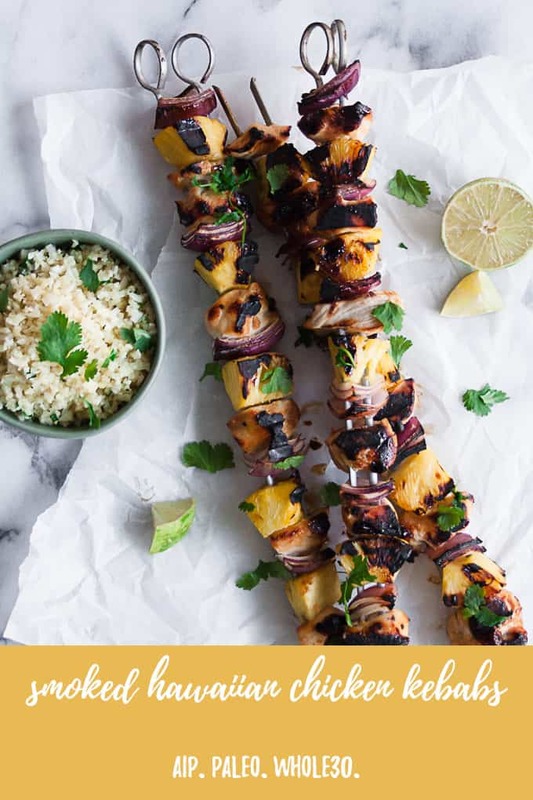 Made with only 5 ingredients, these smoked Hawaiian chicken kebabs are an easy weeknight meal that is Whole30 and AIP approved! Serve in lettuce wraps or over cauliflower rice for a full meal! I honestly cannot believe that it is already day 24 of January Whole30 – WE ARE SO CLOSE TO FINISHING! And to be honest, I’m ready to be done. Last week was rough. I was in a total funk, not feeling like myself, and really not excited to eat anything that was Whole30 or AIP compliant. So here’s what I did to get me out of my funk and back into the game. Made some tea, read a book and took a nap. Focused on changing my mindset and breathing through yoga. I’ve been doing a lot of yoga this month and it has been so helpful to get me back into a good headspace. Watched Parks and Rec and The Office bloopers on YouTube << This is seriously the BEST way to get me out of a funk. I always end up laughing to the point of crying and I totally forget about whatever I was focused on before. Made these insanely delicious, Whole30 and AIP compliant Smoked Hawaiian Chicken Kebabs! HUBBA HUBBA. These are a dream. These kebabs, these are what really brought be out of my funk. 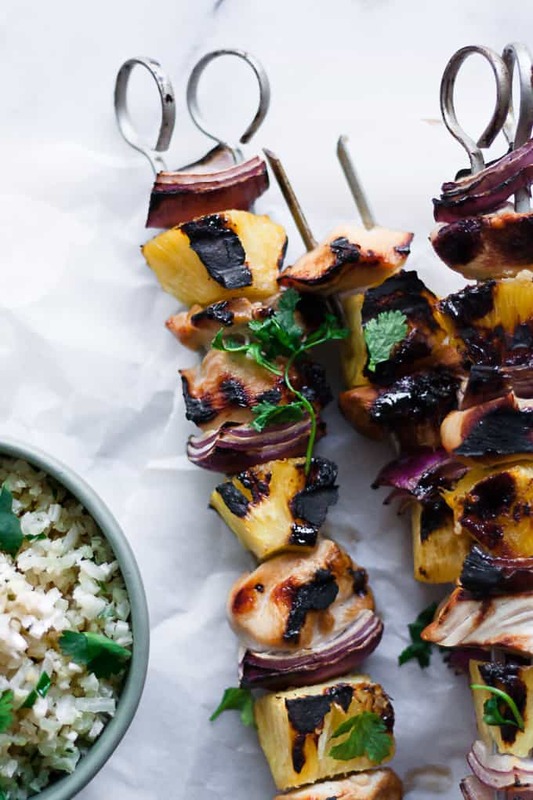 They are the best combination of sweet from the pineapple and smoky from the grill and the ideal sharp bite from the red onion. 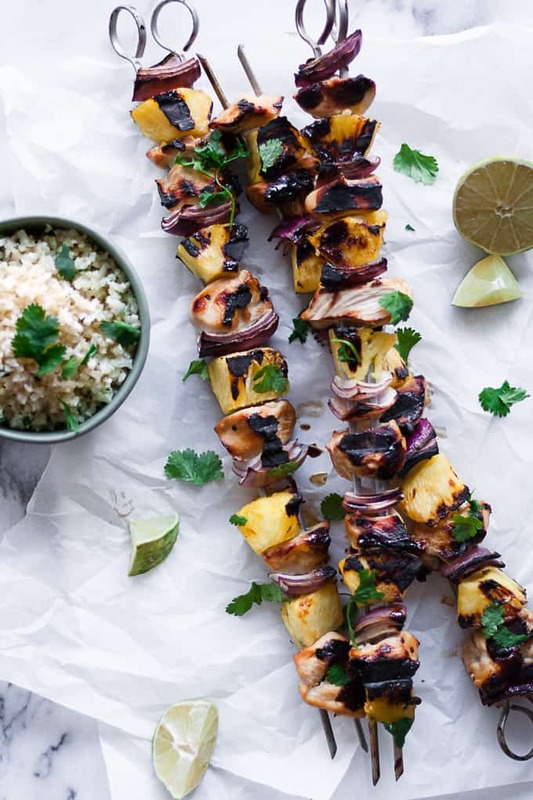 Served with a side of cilantro-lime cauliflower rice or wrapped up in butter lettuce, they make an easy weeknight meal! 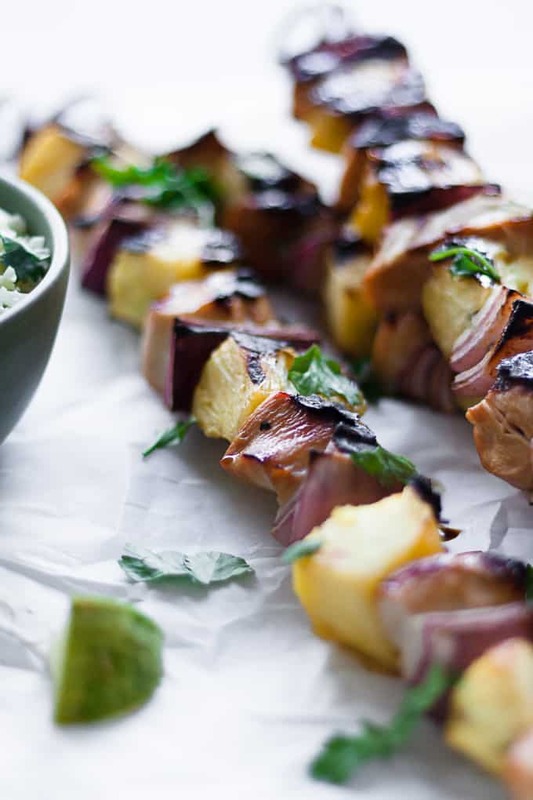 I hope these smoked Hawaiian chicken kebabs make their way onto your table this week, even if you’re not doing Whole30. If you make this recipe, remember to tag @imhungrybynature on Instagram! Whisk together ingredients for marinade and divide in half. Pour marinade into a plastic bag. Add cubed chicken breasts and make sure they are coated. Marinate at least 2 hours. Preheat grill (or smoker) to 500°F. 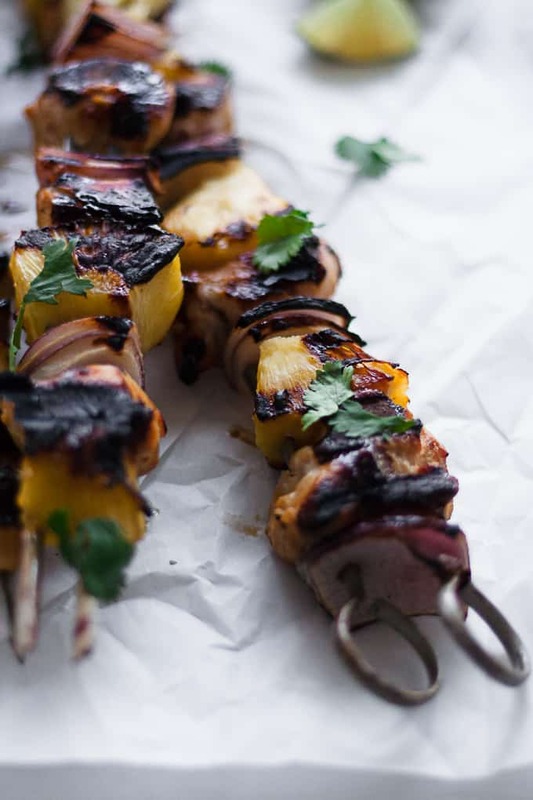 Remove chicken breast from marinade and place on skewers, alternating with pineapple chunks and red onion. Grill 8 minutes. Flip chicken and cook another 5 minutes longer. Remove from grill. Serve chicken with cilantro lime cauliflower rice and cilantro.